Ground Floor: Open plan dining room/kitchen (oven, microwave, dishwasher). WiFi. Cloakroom. Double bedroom (A/C) with en suite shower room. Twin bedroom (A/C) with sitting area, (TV, DVD,CD), en suite bathroom (washing machine) and steps up to first floor roof terrace. First Floor: Landing/seating area with doors to roof terrace. Double bedroom ( four post bed,A/C). Shower room. Outside: Sun terrace. In built barbecue. Shower. Private swimming pool (6.5m x 3m) with side Roman steps. Entering by way of impressive solid wooden, arched doors set into the substantial stone walls that encompass the house you are immediately aware that you have arrived at a property of stature. Just 200m from shops and tavernas and 1km from the sweeping stretch of sandy beach that runs all the way along to Almyrida, Epavlis Plaka enjoys an unrivalled location in the centre of the old village and yet, curiously, is so well hidden from sight that few people even know of its existence! Few houses can claim such a wonderfully relaxed atmosphere. Inside, a restful colour scheme adds a homely glow with the attractive soft furnishings of the living room further enhanced by contemporary paintings and elegant artefacts. The dining area boasts wooden ceilings and traditional carved furniture while thick stone walls help to keep the house agreeably cool when outside temperatures are at their height. The sleeping accommodation is spacious and tastefully furnished with en suite bath or shower rooms and air conditioning. 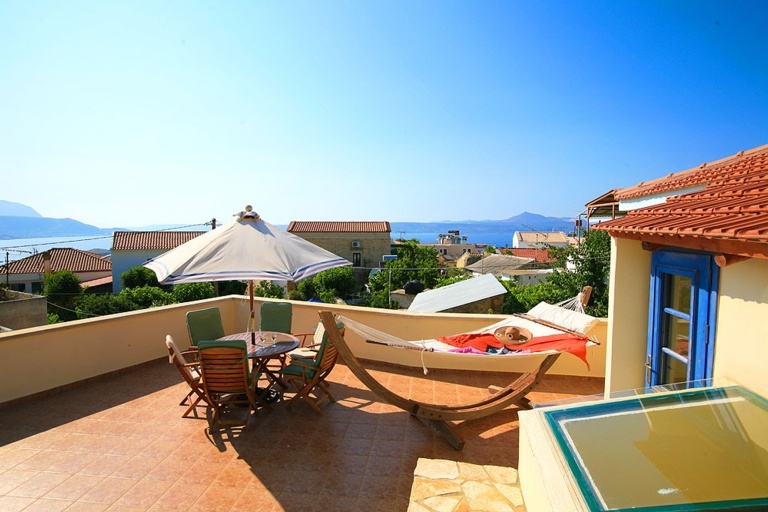 The first floor at Epavlis Plaka is virtually a private suite comprising a double bedroom with vaulted beamed ceiling and four poster bed, a separate shower room and dedicated seating area. The large roof terrace with its table, chairs and chunky hammock presents the perfect place in which to relax and enjoy a cool drink, particularly at sunset with gorgeous Souda Bay backed by the craggy silhouette of the Akrotiri peninsula sparkling invitingly ahead. Flanked by low sand cliffs with the imposing White Mountains towering behind, Plaka’s gently shelving sandy beach is considered very family-friendly, attracting swimmers and non-swimmers alike. The village also makes an ideal base for exploring this delightful corner of Crete which has so many interesting places to visit that it is no surprise to see so many visitors return year after year. Art students, historians and amateur photographers regularly come to marvel at the abundance of well-preserved Venetian and Turkish architecture found in Chania (20km). With its warren of cobbled streets and narrow alleyways, the former capital of Crete is an iconic location and a town that merits visiting both during the day and again in the evening to experience the dramatic differences in atmosphere. Daytime is great for general sightseeing, shopping and perhaps a light lunch at one of the harbour front cafés. Evening sees the ancient monuments illuminated, the quayside lined with craft stalls with locals and visitors alike enjoying the night air perusing the menus of the many waterfront tavernas. Open Tuesday – Sunday from 09:00 till 19:00 hrs and visit by far the worlds largest collection of Minoan artifacts. Perhaps the most breathtakingly beautiful drive on the entire island, in particular the stretch of road between Mount Idi and Mount Kedros. Excavated in the year 1900 by an English archaeologist by the name of Sir Arthur Evans, this is a most impressive palace, and we recommend that you hire a guide in order to benefit from their wealth of knowledge. From the village of Hora Sfakia take one of the regular ferries over to this lovely tranquil spot. It is recommended to take a local guide with you, but no trip to Crete is complete until you walk along the deepest gorge in Europe, the Samaria Gorge. A wonderful trip for lunch. You can rent a small boat for half an hour and row yourself around the lake, then it’s time to relax in one of the many waterfront tavernas. Here you can visit the remains of a very important city dating back to the 5th century BC. It really is a lovely walk with magnificent panoramic views. The original capital of the island (since 1971 that honour has been passed onto Heraklion) Chania is one of the prettiest towns in the whole of Greece (perhaps on a par with Monemvasia, Nafplion and Corfu town). The city is reputed to be the oldest city in the world, and the mix and match of Venetian and Turkish influences and architecture. The Maritime Museum delivers a superb introduction to the History of Crete and is by no means only for maritime mavens, you will learn more here in half an hour than most could teach you about the events that filled Crete's moving past. Elafonisi (Island of Deer) is like paradise on earth, and posessess a wonderful beach with pink coral sand and crystalline waters, a small islet connected to the rest of Crete by a shallow reef that can be crossed when the sea is calm. This islet is lying on the south-west corner of Crete, the journey itself is amazing, with a narrow tunnel and stunning wild Cretan scenery. Beware in high season, it can get very busy, but is so large, there is always a peaceful spot to be found. There is an excellent taverna at the beginning of the sand dunes. On the way out of the village of Kalyves going West to Kalami there is a sign and arrow to Koumos. This place is worth a visit and is known as 'one mans folly'. A collection of buildings including a taverna and a chapel with a domed roof all built from local small misshapen stones. This eclectic mix of buildings are all made from small rocks and all built by one man over a period of 10 years. There are mosaics on the paths; whilst walls display images of fish, snakes and various animals. There are also stone tables and chairs. If you just want to wander around, take photographs or just be amazed,pop along as there is no admission charge. Look out for the occasional ostrich or even a llama - quite surreal as these weren't made out of stone! The Cretan Runner written by Giorgos Psychoundakis is a great book describing some of the heroic exploits the Cretan resistance along with British soldiers and pilots got up to during the second world war. Giorgios was originally a shepherd but became a member of the resistance after the German invasion. His heroic and selfless exploits and the general population are described in the book. It is regarded as a classic book of its type. There are two British War cemeteries in Souda Bay, however, much of the action took place around Maleme where a large German War cemetery dedicated to German soldiers was until recently tended by Giorgos himself. The British cemeteries are in a beautifully kept place, moving and humbling. If it gets too hot down by the sea, drive up to Spili a picturesque village located at an altitude of 430 metres, 28 kilometres south-east of Rethymno. Due to its altitude the village offers an astonishing view. It is surrounded by verdant vegetation and is filled with trees, fountains, springs and chapels and churches with wonderful murals. The main square of the village is lovely and has a fine stone fountain consisting of a row of stone carved lion heads from where crystal-clear water flows.The water guarantees that the air is fresh, cool and pure. It is also known for a unique type of weaving and has a few tavernas and an old fashioned atmosphere. Enjoy a Greek coffee at the square in the upper village (Agios Georgios square), the atmosphere here is wonderful - hospitality and welcomes are surprising in their warmth. 740 metres up on the north face of Mount Psiloritis it's a short hop from here to the stunning Nida Plateau, the Ideon cave (mythology: Zeus grew up here), the observatory at the top of the Skinaka as well as the ancient settlement of Zominthos. In Anogia, excellent local cheese and Raki are available to buy, at the shop on one corner of the square. Here you are more likely to see men wearing the Cretan baggy trousers tucked into their boots, heads decorated with nets, than just about anywhere else. The small church of Agios Georgios is worth a visit if it is open. From May to October, you can take daily cruises from Kissamos port to Gramvousa and Balos (42 km west of Chania), leaving in the morning and returning in the evening.Gramvousa (also called Tigani peninsula) has a castle on top of the island built by the Venetians to protect Crete from a Turkish occupation. It was one of the last unconquered bastions and it was the first area of Crete to be liberated from the Turks in 1825 (Turks were not expelled from all the rest of Crete until 1898). 3000 Cretan rebels were planning operations from Gramvousa. During this period of turmoil, the residents of the island started looting boats passing through, which gained the island its pirate reputation! The Gramvousa/Balos region is a protected biotope. There are 400 different plants on Gramvousa, 26 of them endemic to Crete. The Anthemis glaberrima (a type of daisy), the Allium platakisi (a wild onion) and the Silene litegripetala are found only in this area and are protected species. In the shallow parts of the sea, the Mediterranean plant Posidonia oceanica thrives, providing shelter for marine life. 98 bird species have been reported in the area. 20 of them are protected and 14 of them are threatened species (like the vulture Europe Gypaetusbarbatus). The Mediterranean seal (Monachus Monachus) and the Caretta Caretta turtle find shelter in this area. Also, a herd of wild donkeys lives on the peninsula! This breath-taking large natural lake is the only one in Crete, and the brillliant aquamarine waters are a wonderful backdrop for a spot of lunch. Afterwards, you can rent pedaloes or a small boat for half an hour and row yourself around the lake, and work up an appetite for supper! Up in the Eagle's nest (Aetofolia) in Samonas village, perched high up, with views to the valley and sea reached from twisting narrow mountain road (quite a drive! ), you can find authentic, quality home cooking by Mrs Katerina, the owner. Simple and pure food with good local ingredients (their own eggs, chickens etc). Call to pre-order food the morning before an evening visit, otherwise the selection is limited. But you can always find a lamb tsigariasto, which is cooked perfectly here, a potato and vegetables omlette, wonderful greek salad, keftedakia (meat balls) and the tastiest fried potatoes. In the summer, if you are lucky and she has stuffed tomatoes, they are fantastic. On the way from from Chania to the beach of Elafonissi via Drapanias there is a sign stating Wine Museum, a bit like the Agroturismo places in Italy. The Pnevmatikaks Winery is a nice and delicious wine tasting venue, a family business that grows grapes and olives. You can taste all they produce: different wines including a wine called Romeiko, produced the way it was done in antiquity. The Romeiko has a taste similar to a nice sherry and is 14.5 proof. Recommended produce are their olive oil and Raki (tastes similar to Grappa). If you purchase wine and/or oil they pack the bottles in such a way that they arrive safely home.